For some background to this long-running and always beautifully documented series of gatefold albums, it's best to read earlier reviews. 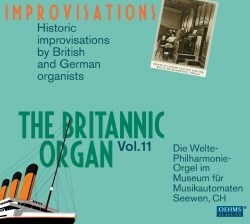 This is the eleventh volume and focuses on improvisatory performances by British and German organists. The first disc is devoted to Welte rolls made by three of the most distinguished British organists of their - or any - time; Lemare, Hollins and Wolstenholme. That the company positively encouraged improvisations seems self-evident given the number of roll improvisations that have been preserved. In any case both Wolstenholme and Hollins - both were blind - were famous for their improvisations and they were popular in Germany in the years before the First World War, as indeed was Lemare, the biggest name of the three. Lemare recorded six improvised rolls, varying in length from three minutes to 13. The first is a veritable study in dynamics, playing of deft refinement and elegance, whilst he reserves the use of Vox Coelestis for the second, recorded in 1913, and dedicated to his German friend Karl Bockisch. Bell and harp effects can be savoured in the third improvisation - it's droll but with a strong contrapuntal element at work. He was a very strong fugal player. He plays a thoughtful improvisation on Old Folks at Home and introduces one of his gentle baroque-leaning Minuets in the fifth of the set. The longest work is his salute to Hollins - the theme is his Allegretto grazioso and it makes a compelling end to his selection. Hollins himself contributes a single six-minute work and vestiges of his old career as a virtuoso pianist seem to have intruded here - listen closely and you'll hear some Schumann just before the fugal passage. This roll had been badly damaged and some excellent restoration work has ensured that it's playable. Wolstenholme left two improvisations, one witty - indeed genial - and the other very much longer and more revealing stylistically both of his playing or suggestions of it - this is a roll, after all, not a disc recording - but also of his compositional practice as well. Contrasts, registers, colour; this has it all. The second disc has a variety of German organists. It includes the earliest German organ improvisation on Welte roll, by Carl Hofner in 1911. Kurt Grosse's first improvisation, which marries elegance and power, sounds quite markedly British, so may point to a vogue just before the War for Lemare-like playing. His other rolls are decidedly Wagnerian - a much more pervasive influence on the legion of recording German organists. Indeed, Paul Mania takes things several steps further with an improvised potpourri on Wagnerian themes - fourteen minutes of Top Twenty hits. Mania also cleaves to an interest in baroque movements, though in his case he favours the Gavotte. His fantasia on old Dutch songs is much the most stirring, striking and refulgent of his improvisations - a marvellous exhibition of the improvisatory arts. There's a single example from Otto Dunkelberg recorded very late in the day for a roll - 1937. Finally, Henry Burkard - or 'Dr Svara' as he appears on the roll - provides a real oddity; a silent movie music soundtrack, in effect, covering all sorts of movie moods. It makes for a quixotic, amusing envoi. Once again, at the risk of boring readers, Oehms continues its outstanding standard of presentation. This Welte series puts out consistently among the best looking productions on the market today.